Be the first to share your favorite memory, photo or story of Janet . This memorial page is dedicated for family, friends and future generations to celebrate the life of their loved one. 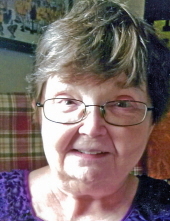 Janet Marie Dautremont, 71, passed away unexpectedly in her home on Sunday, November 11, 2018. Janet was born on December 13, 1946 in Iowa City to Stephen and Eileen (Prizler) Dautremont. She lived most of her life in Riverside until moving to Coralville at the age of 59. Janet was part of one of the very first Special Education programs in Iowa, graduating from Washington High School, Washington, Iowa. After graduation she started her career with Goodwill Industries. In 1976 Janet was hired at the University of Iowa Laundry where she worked for 35 years. For Janet, there were three things in life...church, family, and the Hawkeyes. As a devout Catholic, Janet attended St. Mary's church in Riverside where she and her mother could be seen in the same pew every Sunday. After moving to Coralville, Janet attended St. Mary's Catholic Church in Iowa City with her friend Christie. Janet loved nothing more than her family, especially her great nieces and nephews. Her face would instantly light up and she always had a new book ready to give to them. She also had great love for her sister-in-law, and closest friend Sharon, who was a constant support for Janet. Whether it was football, basketball, or wrestling, Janet was always rooting for her Hawkeyes. Her favorite was Hawkeye wrestling. Janet could recite the players, schedules, and stats. She was through and through a true Hawkeye. Janet is preceded in death by her Father and Mother, Stephen and Eileen, and her sister and brother-in-law, Lynn and Tom Lickiss. She is survived by her brother and sister-in-law, Mike and Sharon (Gerot) Dautremont and their children, Wes (Jen) Dautremont, and Stacy (Aaron) Walker. Great nephews and nieces include: Jack, Cora, Lila, and Gavin. Along with family members Gretchen and Boyd Lickiss. Funeral Services will be held Sunday, November 18 at 4:00 PM at Lensing Oak Hill, 210 Holiday Rd., Coralville. Visitation will be from 3 PM to 4 PM Sunday. Family interment services will be Monday at Saint Vincent Cemetery in Riverside. To send flowers or a remembrance gift to the family of Janet M Dautremont, please visit our Tribute Store. "Email Address" would like to share the life celebration of Janet M Dautremont. Click on the "link" to go to share a favorite memory or leave a condolence message for the family.